If you're facing a PCS to the Monterey, California area, you may be interested to know that Pacific Grove is home to many military families stationed in Monterey. Why do so many choose to live there? The town is conveniently located less than five miles from the Naval Postgraduate School, The Presidio of Monterey, and the U.S. Coast Guard Station. It is the quieter option of neighborhood living compared to Monterey. 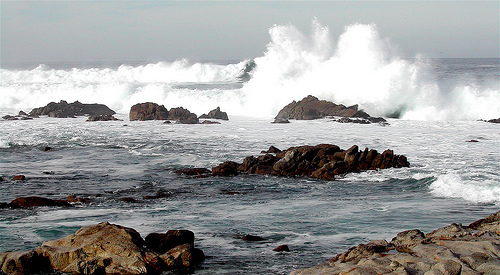 Pacific Grove has a pretty equal distribution between young families, older adults, and retirees. You'll hear regularly how “Mayberry” it is living there. There are apartment dwellings and single family homes, which tend to be on the smaller side and are older builds. PG, as it is affectionately known, has its own quaint downtown with a few standout eateries and boutiques. Most residents are in walking distance of downtown. Pacific Grove Unified School District (PGUSD) has a very strong reputation, with California state scores to back it up. PGUSD encompasses two elementary schools, one middle school, and one high school in addition to a few other specialty school programs. Our experience was pleasant and I am pleased our elementary aged daughter was part of the system, but I have yet to see how her education translates to our new school in Virginia. Negative attributes I encountered were comments regarding the lack of diversity within the student body and difficulties military children faced when leaving PG schools and trying to catch up in other state public elementary schools. For a small town, Pacific Grove does provide a good bit of community entertainment, especially for children. There are festivals of all types, farmers’ markets, outdoor activities, and many opportunities to just hang out and enjoy the Monterey Bay. A major draw to the area is the Monterey Bay Aquarium. Locals are super proud of this facility as it is built right into the coastline and shows off monumental views of the bay. We definitely got the full use of our annual pass there. PG is also synonymous with its Monarch butterfly sanctuary, as the town is nicknamed Butterfly Town, U.S.A. In addition, its harbor seals beached on Hopkins Point are a treasured source of entertainment for all who pass by. Walking is a huge pastime for locals and visitors because the scenery is just that stunning. I walked for hours most days while living in Pacific Grove, which meant I was able to see many more miles of scenic interests than perhaps a tourist cruising in a car would. A good friend and local turned me on to a loop of about 6 miles that included beachfront trails tying Asilomar State Beach and the Monterey Bay Coastal Recreation Trail together. Both are well known and loved by residents and tourists alike. Although my walking path through Asilomar was the same, the view varied daily ranging from sunlit skies to blankets of clouds and fog rolling onto the shore. A unique and sweet twist to the regular seashore sightings was the abundance of wildlife on the beach. After a few outings, I was able to recognize families of deer and a friendly hawk who greeted walkers and runners along the path. This is in addition to, of course, the ocean dwellers such as otters, harbor seals, and the occasional spouts of various whales in Monterey Bay. We so enjoyed our time living and sight-seeing in Pacific Grove!